A few days ago I posted a color-by-number picture in Spanish of a traditional skull for Día de los Muertos. 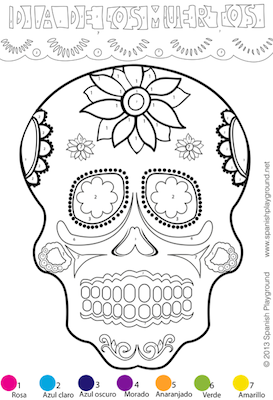 It is a fun way to introduce kids to some of the symbols associated with the Day of the Dead. As I mentioned in that post, some of the spaces on the drawing are small, so I wanted to share another, simpler version of the same calavera. This Spanish color-by-number picture has larger spaces and is easier for younger kids. It still has the designs and colors associated with the traditional symbol, but I hope that it will be fun for a wider range of ages. To make the most out of an activity like this, be sure to speak Spanish to kids as they color in the different areas. You can use color words, parts of the face, and verbs like colorear or pintar to talk about what they are doing. If you have the time and inclination, a great way to have these conversations is by coloring your own picture and commenting on what you are doing, too. I have found this prints better when you download it, rather than printing from the viewer. I used these during celebration and the kids were thrilled!